We got an email from our next door neighbors. They told us that the dog of their lives had to go to the bridge. Wednesday morning we had to let go of Lilly. She began cluster seizuring Sun nite and then after I got home Monday afternoon it started again. We ended up getting her to the vet to get Valium injections to stop them. They were quite violent and unlike the previous ones. Came home with more Valium, had another at 10:30 and got it stopped with Valium but again at midnight. We brought her to the amazing emerg clinic on Cave Creek and 101. We were hoping we could get the clusters stopped but were unsure of what brain damage occurred. She progressed a bit but the consensus of those vets were what I suspected. The reason of the seizures were taking over and I couldn’t let her continue in that confused state although she tried hard to lick a frosty paw Tues.
By Wed morning we felt it was time to let her go. We are beyond consoling and Pat is a mess. We had planned to go skiing at Brian Head with grand boys when she had gone 33 days without a seizure. So we had to get out of that house so we went. Will be back probably tomorrow night. As you know, it hurts bad, especially when there is no other dog to care for at home. Just wanted you to know and that we won’t be able to talk about it as we start crying…. So, Blogville, please send Lilly’s peeps an email. It doesn’t have to be long and involved but please mention where you are located. It would help Lilly’s peeps to know that they’re not alone and people care from all over. They don’t have a blog but read this one. 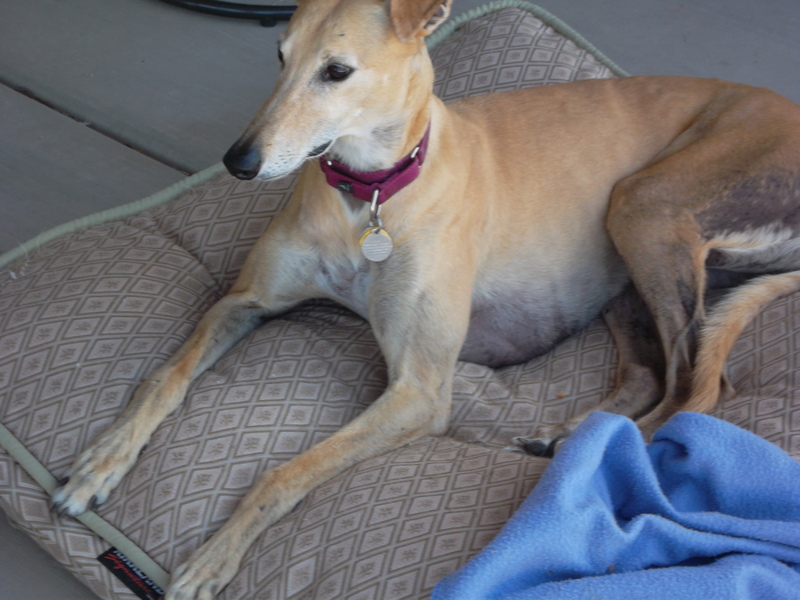 Lilly was a rescue greyhound. She actually raced walked three times and was last all three. Lilly was a much better friend than a racer. Kenzie, Kyla, Kaci and Kali all liked her. Kali stood on her hind legs to give Lilly face licks. Not only are Lilly’s peeps devastated but we’re getting a body blow a week. Stuart, Kyla’s one year anniversary and now this. Make this bird’s day. Send an email. ← I wasn’t shut out! We just sent them an email, so sad , and magnified by the fact that they wouldnt have had the love and support of Blogville!! So kind of YOU to inform us so that we could be there for them! You are a GOOG EGG. An unfertilized one at that! I am so very sorry to hear this! It has been a tough few months. Email already sent. It was great, considering that Lilly didn’t drink margaritas and have that wonderful scent on her mouth. Thank you, Kismet, for letting us know. As hard as it is to lose a family member, it has to be pretty powerful to have Blogville support. Lilly was a sweetheart. She run up to the peeps, not to scare them but to get loving soomer. Sorry to hear bout your pal. There’s too much of this going around. That makes sad. We know they have a huge hole in their hearts. It’s a big hole-Lilly was big. So very sorry to learn of the passing of your friend Lilly. No more seizures now and even though her humans’ hearts are breaking, they must have some peace knowing she’s no longer confused and scared from what was happening to her. We’re sending hugs for her family – and for you all as you knew her so well. Thanks-it will mean a lot to the peeps. They don’t have another dog in the house to hold. Done. Very sorry to hear. Of course you know how much it comforted my peeps when they lost their Sadie last Christmas. I hope everyone sends a note. We are all hurting for them. Losing a family member leaves a big hole in your heart. Even though my Mom has me now, she still cries for Sadie. Our prayers are with your friends. As you know, we went through this last year at the same time. We know. Done. We are so very sorry to hear of the loss of your friend. We know that pain…words just cannot express…sending hugs and prayers. Even though Lilly wasn’t “our” dog, we feel the pain. Thanks for everything, Easy. You have your own problems (beagles). we were not close friends, but it always hurts so much to hear that a furfriend is no longer with us… and I’m so sad for all who have to go through this part of life… I always remember how I felt that time and I wish I could turn back the time to save all…. It just keeps getting worse. My heart is heavy for Lily’s peeps. And for you. Doing it now. When we open our hearts to these marvelous animals our hearts are going to break when we have to say goodbye. “It’s the circle of life, and it moves us all through despair and hope, through faith and love. Till we find our place on the path unwinding.” I always like that quote fro the Lion King. I am just telling them here that we are saying a pray from them. Unfortunately, we’ve never seen the movie. You sent them an email, right? I feel strange sending e-mails to people I don’t know, so you can pass it on if you wish. Heck I just opened your Christmas e-card, I sat it in spam because I did not know the name on the e-mail. I almost tossed it. Thanks for the card. That’s OK, I still have your 2014 calendar on the office wall. Wish mom hadn’t read that at work. We will keep Lily’s peeps in our prays and send them an email. Thanks-the surviving peeps deserve it. Lily was beautiful. She will have grrrrreat furfriends to play wiff across da bridge. Hugs and wet kisses to her peeps. That she will, remember she can’t run too fast. Thanks-they can use a lift. I am so sorry for the loss of your neighbor. Such a pretty girl. I will email your friends, even though there are no words to stop the pain of such a loss. Hugs to all of you. And thank you for coming by for our Sam. . I wish we didn’t have to share grief but grief will happen. I sent an email. I read the Lilly’s Dad is/was an airline pilot, something I did for a while, and I know how attached you can get to loved ones at home when you spend so much time away. Lilly’s mom still works as a flight attendant. It was just Lilly and Dad for days at a time. Any friend of you, is a friend of mine. Will gladly send an email to them. Thanks for being a great friend to so many! Thanks for sending an email. As SWTS says, TY4BAF. So so sad. I’m sorry for their loss. We’ve all been through it but it hurts nonetheless. To all those that sent such kind words to help us through the lost of this special girl Lilly, thank you. If we didn’t love these furry four legged dogs so much, it wouldn’t hurt so much. But for all the wonderful days and adventures we had together, makes it worth the pain we know always come. It was a honor to be paired with such a hound. Lori and Pat are Lilly’s Mom and Dad. It’s been a bad stretch during the holidays. Kaci and Kali still look for Lilly out the window. So very sorry for the loss of your friend, will send an e-mail to her peeps now. We sent our condolences. The pain lessens, but never completely leaves. We are so sorry. We still have “Kyla moments” and it has been 13 months. We’re hoping that they get a new friend for us. Lily’s staff had a rough time of it. They’re taking it pretty hard. Lilly would have given you a “run” for your money. Email sent as we just read this today. Kismet, you are a real pal. We understand your friend’s loss all too well. Mom doesn’t usually let us wander around the blog’oshpere as we tend to linger on the treats and toys sites. She will add your blog to our future reading material, though. She always gets a kick out of you. There are times when things are more serious and this loss is one of them. You are right. We meant no disrespect and apologize. Always hard to have an animal you know go.